So I thought I’d come up with a Full Moon spread for the fans of the Wildwood Tarot over there in facebookland. Am popping it here in case it might be something that you want to add to your own toolbox. Focus on one aspect of your life that you seek clarity on and think about The Moon* card from your deck (it’s going to be acting as your totem in this spread). Give your cards a good shuffle, face-side down. When you have shuffled sufficiently, turn your deck over, face-side up. Without changing the order of the cards in your deck, work your way through the upturned deck until you spot your Moon card. The card ON TOP (ie the card in front of, or before, The Moon) shows you the energies that can be embraced to gain clarity. 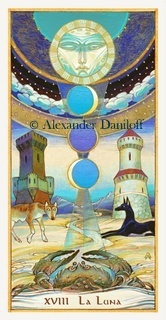 You don’t need to interpret The Moon card itself as it was acting as our sign post to find the best cards. * If your deck doesn’t have a Moon card, pick another card that has a prominent moon feature. Wat a great way to find my embrace and release card I pull for every new moon! Embrace and Release cards sound perfect for a new moon, Ellen!